We were all saddened at the passing of Greta Thyssen, the Danish beauty who graced the covers of so many magazines, and starred in many films that have a cult following. Like Julie, Greta was sought after for memorabilia show appearances, so that fans could get her autograph on a vintage photo from "Beast of Budapest," "Trouble is a Man" or "Journey to the Seventh Planet," to acknowledge some of her feature films. Of course, fans also wanted the pin-up pictures Greta had on the table, from her Miss Denmark days to her triumphs in America, being sought after for photo shoots in top magazines. We can't forget that 3 Stooges fans idolized both her beauty, and her bravery in working with Moe Larry and Joe Besser, and not ducking the occasional pie. 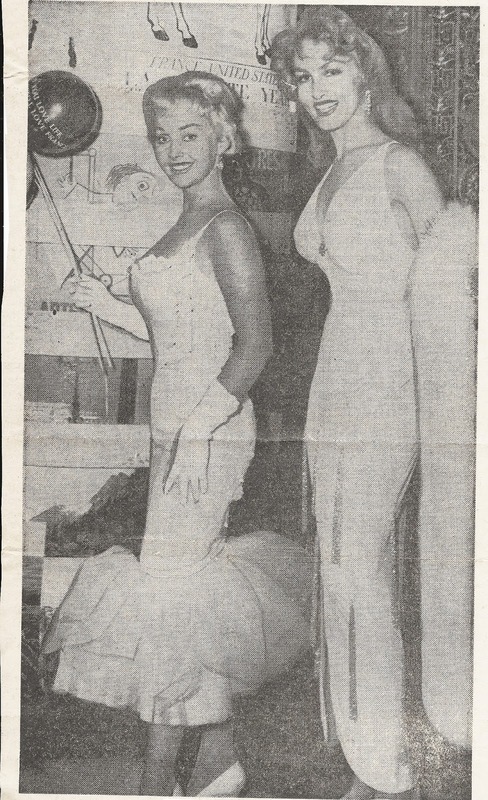 Here's JULIE and GRETA back in 1958, attending a glamorous movie premiere at the Paramount Theater. Julie very much enjoyed the times she could have a chat with Greta. Both ladies were known back then as not only beautiful, but brainy. They could talk about a wide, wide range of topics. Greta's daughter is a professor in upstate New York. Greta lived on the Upper East Side in New York, and literally had heads turning even in her 80's. She wore high fashion clothes, high heels, and people knew she was someone special...if not a movie star, then a society lady, or maybe even a literary lioness. Greta enjoyed sitting in on acting classes, but her main avenue of creativity was painting. Her apartment had a lot of her paintings stacked vertically in the hallways, so they could be "flipped through." There were too many for the walls! Greta was a "Catwoman," too. Prowling her elegant, penthouse-styled spacious apartment was her black cat, Inky. There wasn't man nor beast, nor other actresses, who didn't admire The Great Greta.